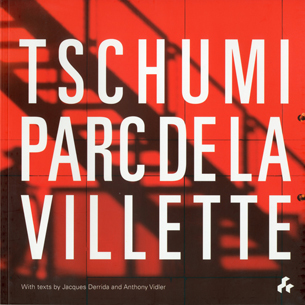 Tschumi Parc de la Villette is the first publication to document comprehensively Bernard Tschumi's first, and arguably still most celebrated project. With new and republished writing including a text by Bernard Tschumi and Anthony Vidler's "Trick-Track" originally published in 1986, alongside a newly-commissioned essay assesing the Parc from a contemporary and historical perspective, this book documents Parc de la Villette from its conception, through the 30 years of its existence, to the present. Tschumi Parc de la Villette includes drawings, concept sketches, models and photographs showing the development of the Parc over three decades, brought together in a single volume for the first time since the 1980s. One of the "Grands Projets" commissioned by the French Government in the 1980s, Parc de la Villette set a benchmark for urban parks in the latter part of the twentieth century and into the twenty-first. Tschumi constructed a series of follies across the site, creating what he called "the largest discontinuous building in the world". Published to coincide with the 30th anniversary of the Parc, Tschumi Parc de la Villette broadly celebrates the project, and articularly the way in which it has been embraced by generations of Parisians and a diverse international public.